The folks over at AnandTech have compiled a short analysis of the A8 SoC introduced in Apple’s new iPhone 6 and iPhone 6 Plus, with its PowerVR GX6650 GPU and 1GB LPDDR3 RAM. It seems that the A8 will be 1.5x faster than the last year’s A7 chip, replacing a 4 core G6430 with the 6 core GX6650 which should give it a 50% graphics performance boost over its predecessor. The source notes that they have “just enough information” on A8’s CPU performance to infer a couple of points about the chip, starting with the clockspeed. 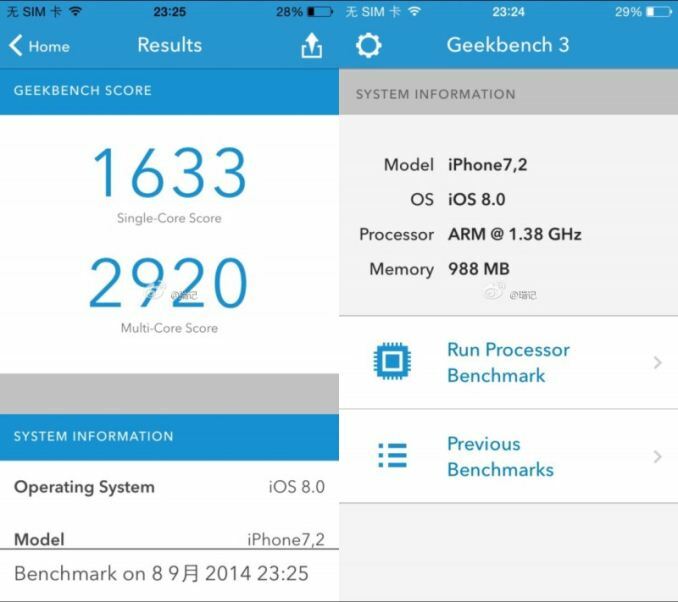 Since Apple prefers low clocked SoCs, the 1.4GHz reading in leaked Geekbench 3 results (shown above) appears legitimate. In which case this would be a 100MHz increase over the 1.3GHz A7 found in the iPhone 5S. However, they predict that there must be “a lot more going on under the hood” to improve the A8’s CPU performance other than clockspeed alone. Lastly, the apparent validity of the Geekbench 3 leak means that one last piece of information on the A8 can apparently be confirmed i.e the earlier rumors about it being paired with 1GB of RAM are true.